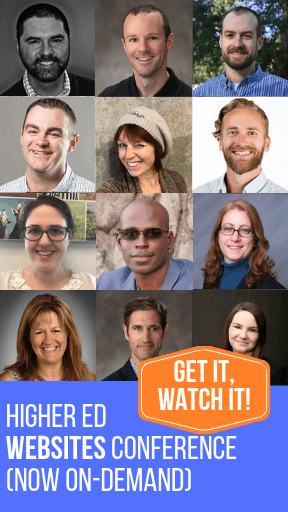 Video has become a key online format for higher ed institutions. With most social media platforms giving an organic boost to videos uploaded natively, some videos can reach thousands of viewers in no time. But, what does it take to make a successful video? Not easy to know. 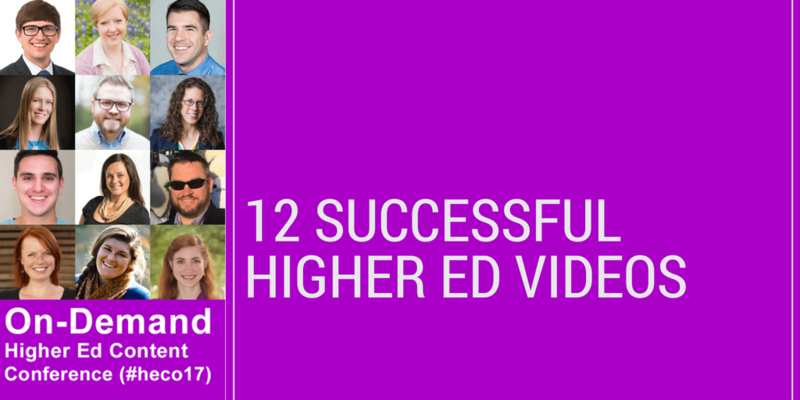 That’s why I asked the 12 higher ed professionals of the 2017 Higher Ed Content Conference to tell us about a successful video created by their school. Our most successful video of the last year is what we called our “Traditions” video. It focuses on the key traditions at WVU. Across our social media platforms, this video has more than 1.3 million views, which more than quadruples any other video we’ve posted in the last year. While the numbers surely prove the video was successful, we used this video as a springboard to an entire series of what we termed “hype videos.” Each season, we’ve developed a short, social video showcasing the different traditions and sights of our campus and state; we’ve found similar success with those videos. Our annual holiday greeting video generated a lot of good vibes on social in 2016 with 45.4K YouTube views and counting, making it one our most viewed videos in recent years. Each year the video is charming, but this time it really tapped into the excitement of winter break thanks to some fun storytelling with heart from a great cast of students plus our president. It’s an excellent example of what can come about when you have creative minds working together, talented students and a president who’s a good sport and embraces the importance of good content. The most successful video was the day before Election Day when we had a surprise visit from President Barack Obama on campus. He greeted the crowd with our most famous line, “It’s a great day to be a Wildcat.” The video was shared over 2,775 times and gathered more than 19,800 reactions and over 57,000 post clicks. Sinking a half court shot to win paid tuition is the kind of thing that makes headlines! Here’s the video. One of the University of Rochester’s most successful videos was about the Rochester Cloak, a device that uses ordinary lenses to hide objects across a range of angles. The video currently has more than 1.7 million views on YouTube. With something like cloaking, you definitely need to tell the story with visuals. This optics research yielded cool videos, GIFs, and photography that we’ve been able to reuse and repurpose, including as part of our Harry Potter-inspired takeover for April Fools Day in 2016. As the chair of Kennedy Library’s Take5 committee, I organize events that de-stress students during mid-terms and finals week. We regularly bring therapy dogs, shelter cats or dairy goats to campus for “cuddle your stress away” events. The most played video (2,500 plays) is called “GoatPro: Goats at Kennedy Library” starring one of the goats as the “narrator” of the video – we mounted a GoPro on her back, and you follow the event through her perspective. We share videos on social media, the library website and our vimeo account. We have really amped up our video production in the last year and we have a really talented Media Services team that we work with. The We are UNB video that we produced for our brand launch was the most impactful video internally. I used our new brand foundation (which we developed after significant brand research), and inspiration from my own experience as an alumna to write the script and it was clear when we showed it that that experience was shared by mostly everyone in the audience. It has since been repurposed for several presentation and events because of the pride and affinity you feel when you watch it. We had to edit and re-publish the video, so the quantitative metrics aren’t visible on YouTube. But we ultimately measured its success qualitatively (i.e. In goosebumps) – especially since it was created for an internal audience. While at University of South Carolina, I didn’t get involved in the video process often, but we had a great team of storytellers between our writers, creative team, and new videographer. As our ways to display content expanded so did the video storytelling. The most successful video was created after my departure by CJ Lake, our social media strategist. It featured some of our favorite faculty members attempting to define “millennial vocabulary” such as woke and shade. It quickly went viral via social media! This is a classic example of viral content heavily outperforming created content – it comes down to paying attention to great moments and giving them the ability to spread. In a recent basketball game, our 5’8” guard stuffed a 6’8” post going up for a layup. Our Public Affairs Officer, who was filming the game for the live stream, saw the potential for this quick play and cut it into a 30 second clip with a slo-mo version. We all pitched in to tweet it to ESPN’s SportCenter as a Top 10 Play, who picked it up and featured it on their Twitter and Instagram. Our YouTube of the event now has over 22,000 views, which dwarfs just about everything else we’ve ever done. Sportscenter’s social media got over 6K retweets, 14K+ likes, and one million views on Instagram. The Student Social Media Team often discusses how content performed for St. Lawrence and our manager, Meg Keniston, usually shares analytics she gathers on the back end of posts. Since video production is managed mostly by the staff in Communications and not our team, I’m not often aware of what the University’s goals and objectives are for each video. What I can tell you is, from my perspective, which of the St. Lawrence’s videos resonated most with me was “Welcome New Laurentians Fall 2016”. From a student’s point of view, as well as a senior, this video made me excited because it was authentically St. Lawrence. The people in it weren’t staged, they were Orientation Leaders running around campus in sandals and baseball hats, genuinely excited to welcome the newest Laurentians to the family. It is a very quick video but effectively shows (not tells) the St. Lawrence spirit of community and passion that we are always trying to share with those who don’t know about it. What’s the most successful video your school did?